Admiral is riding a historical high: their new yard in the Marina di Carrara are open for business and worth the visit if you’re an art aficionado as well, because it includes an art gallery, and they have delivered six yachts last season. One of them is the simply named yacht model – Silent. An Admiral sailboat, you ask? This brave new step was initiated by Mr. Giovanni Constantino, the owner of Admiral – an avid sailor, he decided the time was right for his yard to try their luck in that segment of the market. The yard already announced their next sailboat, a 124’ designed in cooperation with the famed French designer Philippe Briand, as well as a whole new sailboat series. Admiral Silent 76’ is a lovely first step in the right direction. We enjoyed testing the Silent – a deck salon cruiser – for many reasons, but if we had to pick one, we’d go with the propulsion. The two engines powering this yacht are tucked in its very heart, isolated and therefore silent, indeed. But Silent is a sailing yacht before anything else, and shows her best side at sail – it so easy to maneuver an experienced skipper might find it a little too relaxing. Equipped with a self-tacking jib and a mainsail fixed to the top of the cockpit roll-bar (and managed by a Magic box), this sailboat sails itself, leaving the skipper to press a few buttons here and there, and turn the rudder as he pleases. The command post offers a multitude of shortcuts that will help run the boat systems, as well as the beloved joystick that makes maneuvering really easy. The bow is easily accessible via large, well protected side passages, and the command post has comfortable multifunktional chairs for the skipper. Admiral is ready to add some serious sails to your boat if you just can’t stand all that relaxation (a 110% jib, a gennaker and a Code 0) that we kind of missed. All the ropes are hidden beneath the deck, leaving the deck free for fun, bringing this sailboat another step closer to modern motor yachts. 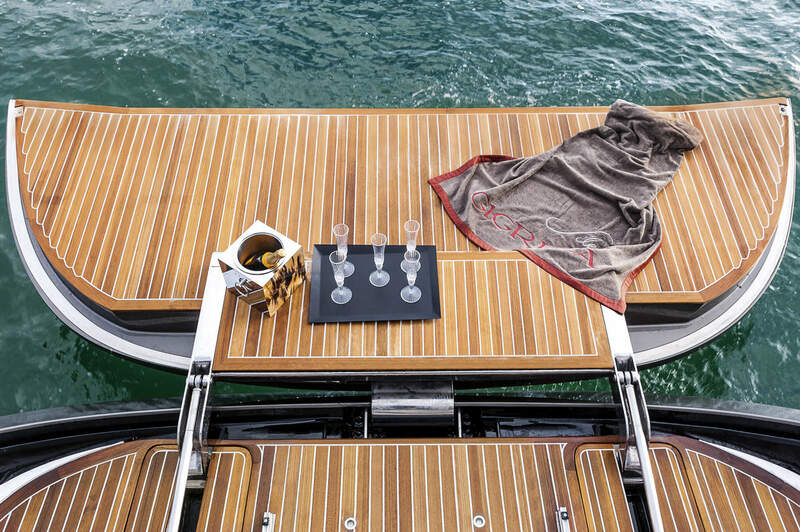 Speaking of motor yachts, Silent boasts another element inspired by them: the cockpit is shielded by the fixed hard top – something we’ve never seen on a sailboat this size. 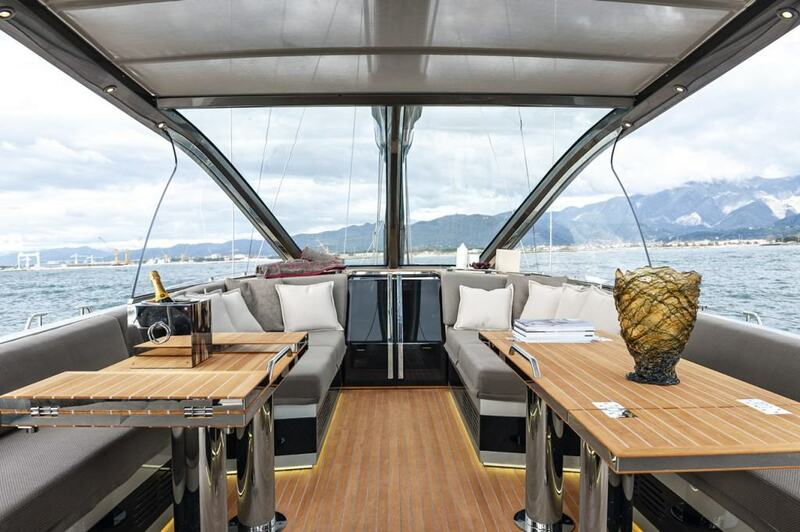 The cockpit is large enough to be a lounge room or dining room, with two large folding tables and is covered in teak, as one would expect from a serious motor/sailing yacht crossover. Roomy, comfortable and perfect for lounging or al fresco dining, the cockpit is probably our favorite place on the boat… rivaled in functional sense only by the stern garage, large enough for a 10’ tender and a jet ski! 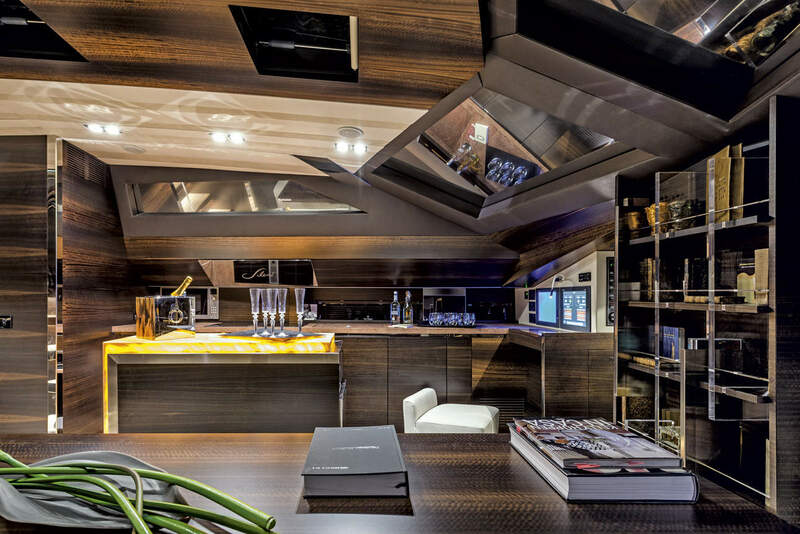 Admiral is a luxury yacht builder before anything else, a fact well reflected in the interior of the Silent. Furnished and decorated according to her owner’s ideas, this first yacht is spacious enough to have the look and the feel of a larger boat. Different types of leather, glossy lacquered woods, onyx and marble surfaces with light Kevlar and GRP construction all come together to create a perfectly functional, yet aesthetically pleasing surroundings. The boat has four cabins, three located in the stern part; the most impressive and the largest among them is the master cabin full astern. In a full beam size, this cabin has a separated toilet and shower areas, and several design and function elements that give it the feel of a big motor yacht, like the TV hidden behind a mirror when not in use. Admiral Silent has two twin cabins and a VIP in the bow. The galley is adjacent to the salon, on the port, and has a rather interesting backlit stove doubling as a bar. With its very first sailboat, Admiral has proved they have something to say in this category, and we can’t wait to see their next move. Not at lagging behind motor yachts of the yard in terms of aesthetics, luxury or functionality, this ‘sailyacht’ named S/Y Gigreca needs just a few sails more to be perfect. Fair winds and calm seas, Silent.